For our leap year show, we decided to mix it up with the Old and the new Soca. We get new music from Fantom Dundeal out of Barbados, and once again Selecta Hype forwarded on a mix from St. Lucia's 758 studios which features new work from Bunji Garlin. Sprinkle a few requests and road-mixes and "voilà." 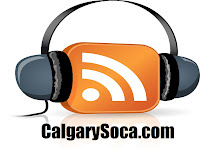 Without getting too personal, the CalgarySoca family lost someone close today. The last song in the mix is for him.